Dogs can scratch for a lot of reasons. Dry skin, allergies and parasites can all cause a dog to scratch himself relentlessly. If your dog is having a severe allergic reaction, he needs to be taken to the vet immediately. 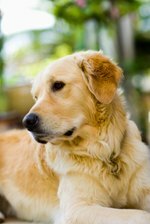 Parasites such as fleas and ticks can be kept at bay with special shampoos or topical applications from the veterinarian. If your dog is suffering from itchy skin due to dry skin or a minor skin irritation, try some of these home remedies to bring him some relief. If you think your dog may be itching because of dry skin, try giving him some olive oil. Olive oil contains lots of healthy fats that keep the skin and coat healthy. To remedy dry skin, add about a tablespoon of the oil to your dog's regular food once or twice a week. Oatmeal is a great soothing agent for the skin. Whether your dog is itching from dry skin or an allergic reaction, try giving him an oatmeal bath. Put some warm water in the bathtub and put in a cup or more of oatmeal. Pour this over your dog's skin. The oatmeal will moisturize the skin and relieve itchiness. Epsom salt is great for relieving itchiness on a dog. Just fill up the bathtub with warm water, add some Epsom salt, and place the dog in the bath. Do not allow your dog to drink the water, however, since Epsom salt should not be ingested. Try aloe vera to moisturize dry skin and soothe itchiness. Only use commercially produced aloe vera gel: do not apply straight from the aloe leaf, as this could be harmful to your dog if he licks it. Pure aloe contains saponins, which are toxic if ingested. Vitamin E oil is another soothing home remedy for a dog's itchy skin. Vitamin E capsules are available in most drug stores and health food stores. You can break open these capsules and apply the oil directly to the dog's skin. Vitamin E can also be given to the dog orally, but this may take longer to provide relief. Contact your vet for the correct dosing instructions before giving your dog Vitamin E.